As expected, South American corn shipments are beginning to accelerate, and given current basis levels there Brazil and Argentina will be the world’s primary suppliers into the middle part of autumn. Brazil in July shipped 2.3 million tons of corn in July, a record for the month and roughly double that of last year. 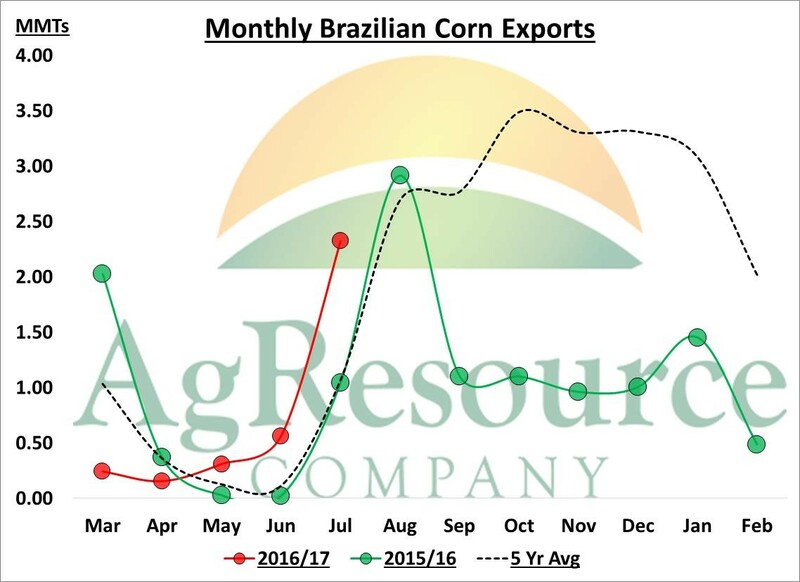 The graphic above charts monthly Brazilian corn exports, and notice that, in non-drought years, Brazilian corn exports don’t often peak until Oct/Nov. Brazil in the next few months look to ship some 3-4 million tons of corn per month, which already has started to weigh on US export sales. However, we do mention that the US Gulf market is trying to compete, and is indeed rather competitive with Brazil. 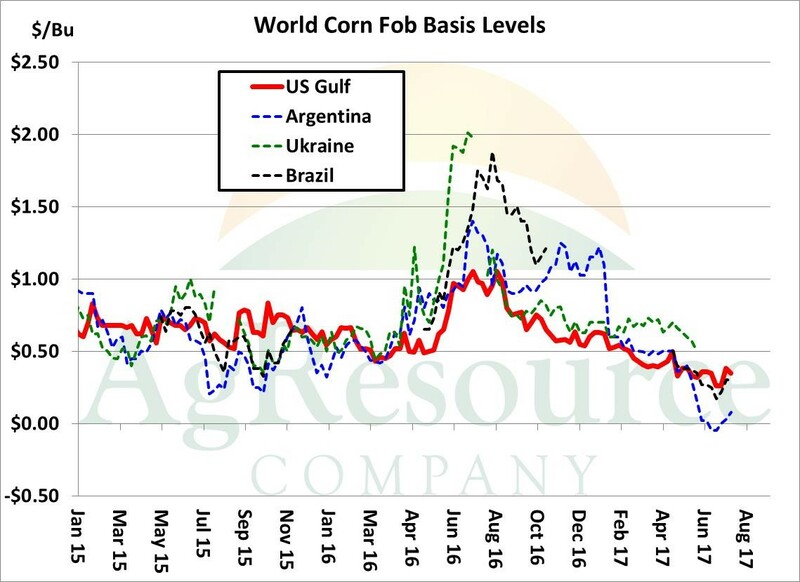 Argentine corn is by the world’s cheapest, offered just $.07/Bu over CME futures, but that market likely scored a seasonal low in mid-July, or at least will have scored one in the next few weeks. US Gulf basis remains near record low, and is well positioned to capture world demand beyond Oct/Nov, if not compete with Brazil in the meantime. Again, South American corn is cheap, but it’s too late to turn bearish South American cash prices. It’s clear that basis in South America is most weak just after harvest, and then seasonally inches higher thereafter. 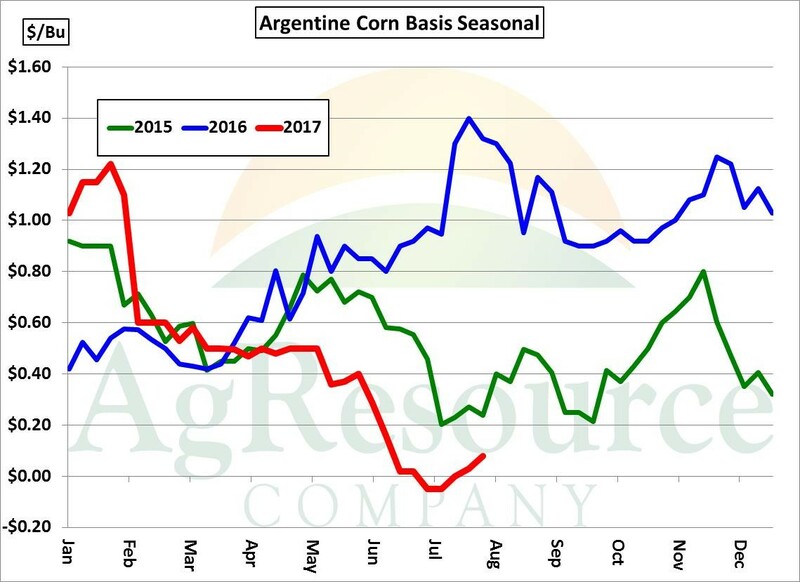 Argentina’s corn harvest has surpassed 60% complete, and as the South American market finds demand, higher prices are anticipated. The corn market now lacks excitement, with pollination nearing its end, and with a relatively cooler and wetter pattern forecast into mid-August. But, like a year ago, our work suggests an ongoing neutral price trend, and so we caution against turning bearish on breaks.